I was lucky enough to be a Teacher's Assistant at CKU Anaheim(Creating Keepsakes University) this past June. When they said, "you want to help out with Ranger Industries? "...of course I said "YES!" Who else was teaching those classes but Tim Holtz! How fabulous was that to be helping out Tim Holtz with his class? He taught two different classes where I was able to also pick up some tips and tricks. He was working with the Adirondack Acrylic Paint Dabbers so I got to learn everything there was to know about these very versatile and cool paints. I learned a lot of things so I will share a little at a time over the next week. This first entry will be an introduction to the Paint Dabbers so you can get an idea of what makes them different from other acrylic paint out there. 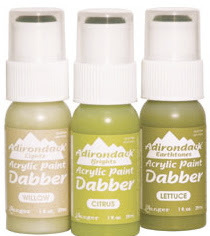 First, Ranger Adirondack Acrylic Paint Dabbers are very easy to use. You don't need a paint/foam brush nor do you need a special "plate" to squeeze the paint out. The "dabbers" have a built in foam cap that you leave on and that is the "brush". There is also a removable plastic lid so you can just cap it when you are done and that will prevent it from drying. You only squeeze what you need so you don't waste and throw away any unused paint. So here are a couple tips I learned about using them from Tim Holtz. When you first get it and are ready to use, shake it up; remove the small clear plastic cap(but don't unscrew the foam top); and "flick it" to get it primed. Invert the bottle upside down now(so the foam top is at the bottom end) and press down so you open the "valve" to get the paint to start flowing. Holding the valve down longer allows more paint to flow. Tapping or banging the dabber really doesn't do anything since it is the valve that has to be open in order for the paint to flow into the foam dabber. You can always dab a little off on your scrap paper before you begin to paint. Now you use the bottle with the foam dabber as your '"brush" and paint away. Hold the valve down again if you need more paint. You can paint directly onto your project. If you do need to get into hard to reach places, you can unscrew the cap and squeeze onto a plate and use your brushes. There are 36 coordinating colors to choose from but you need to know about "Light, Brights & Earthtones" since they all work together. For example, if you just chose Willow(Light), Citrus(Bright) and Lettuce(Earthtones), than you have enough to create some great projects. Here is an example of how these would work together. The sample on the right are the 3(Willow, Citrus, Lettuce) working together to create a fun background. This a manila tag that was first covered in the Citrus by swishing and swirling the paint. Using less paint creates a different look and moving it in circular motions creates the dimension. You can see the Willow dots which are lighter and than the darker dots are done with the Lettuce. You can get some great monochromatic looks with just 3 colors. All the paints have a coordinating Light, Bright and Earthtone color. If you just want to get started, use this handy chart to help you choose a group. In addition to the 36 color choices, there are 4 metallic colors that come in Copper, Gold, Silver and Pearl. You can use with the other colors but what is cool about the metallic is what you can do with just a little or a lot of one color. You can create looks of metal with the way you brush on the metallic paints. For example, if you lightly brush some metallic paint on chipboard square, you can get a cool gunmetal look; but if squeeze a lot on a piece of chipboard, dab it and let dry, than you get a whole different look. Here are samples with Copper and than Gold Metallic Dabbers. Versatile, not too messy and portable. You can easily carry these to crops. 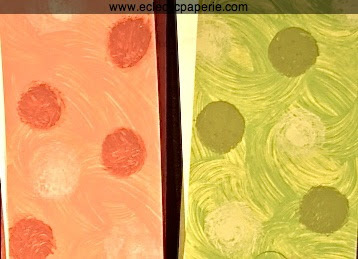 It's hard to decide which colors to choose so good thing they are on sale this weekend at eclectic Paperie. Come back and read my next entry about how these Dabbers can work with those famous Tim Holtz™ Distress Ink Pads. If you are like me, you have a couple of those Distress Ink pads lying around. Wait till you see how you can create faux wood with a little Distress Ink and some Adirondack Acrylic Paint Dabbers. This technique is really fun and one of my favorite tips that I learned.